Growing up in Rome I spent many an hour waiting for the bus at Largo di Torre Argentina, commonly referred to as Largo Argentina. My only thought about Largo Argentina at the time was that it was a convenient central bus hub to get all around Rome. It is and was easy to find because of the central square filled with a bunch of walled-off Roman ruins. It was not until a high school history class at the Overseas School of Rome (thank you Hiram Dewitt) when I learned that, right from my bus stop, I was looking at the site where Julius Caesar was assassinated in 44 B.C. by an angry mob of senators who purportedly stabbed him 23 times on March 15, a date on the Roman calendar referred to as the “Ides of March”. Gazing down at the ruins you can see the remains of four Roman temples that were unearthed in the 1920’s during building construction work. This remarkably important ruin, where Julius Caesar met his end and the Roman Senate revolted, is easy to miss on a busy sightseeing itinerary since there are no markers drawing attention to it. Chances are you’ll walk right by it at some point during your Rome visit and have no idea what it is. That will change in the coming years with the pledge of luxury goods purveyor Bulgari to fund a makeover for these neglected ruins to make them more tourist friendly with a new entrance, lighting, footpaths and restrooms. The start date is projected for 2020 and is expected to take 10 months. 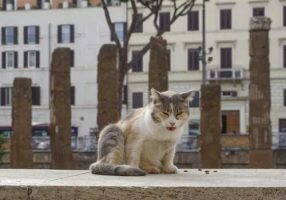 In recent decades Largo Argentina has become known and loved for the many homeless and charmingly photogenic cats that lounge about, basking in the sun, practically posing for the cameras among the ruins. You can even take a cat tour conducted by local volunteers who ensure the cats are fed and cared for, more information here. The location is conveniently central not just for the bus & tram lines but also because it is smack dab in the center, just minutes walk to Campo dei Fiori, the Pantheon, Piazza Navona, the Jewish Ghetto and many wonderful restaurants. It is also a short hop across the river to Trastevere on the tram line. For a quick and casual bite, stop in at popular Rossopomodoro pizzeria along the Largo Argentina, they serve good Neapolitan-style pizza, be prepared for the line out the door but it moves quickly. 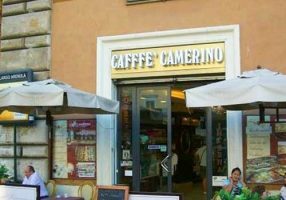 Stop in Cafffè Camerino also on the piazza, where, as the owner once told us “We were awarded an additional F in our name for quality!” See the sign in the image above with, count ’em, three F’s in the word cafe: Cafffè! Their cappucinos are excellent. Enjoy a stay at our Pasquino, Landini, Danza and Viva apartments which are all just a few minutes walk from this historic location.